Air Hogs Batman V Superman Batmobile Remote Control RC Vehicle New Sealed! RARE! Air Hogs Batman V Superman Batmobile Remote Control RC Vehicle New Sealed! Condition is New. The box has some slight cosmetic blemishes, but the box is sealed and brand new. We ship the same business day in most cases. For allergy reasons: I have a dog but he is never around the clothing! AIR HOGS R/C HAVOC HELI LASER BATTLE. AN ALIEN SPACE INVASION. We will work together towards a solution. NEW IN BOX. Millennium Falcon Quad. Air Hogs Star Wars. NEW SEALED. Fed Ex is not an option. Unleash the power of your hands with the Air Hogs Supernova! Launch it, push it, spin it, using just your hands. 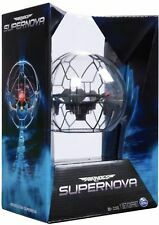 Can you master the Air Hogs Supernova?. MASTER THE MOVES: There are over 30 moves & 9 super tricks that you can master ranging from simple to complex! 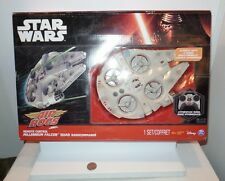 1 Darth Vader’s TIE Advanced x1 Starfighter. 1 Instruction Guide. Air Hogs Hyper Drift Drone is a 2-in-1 vehicle: Race along the ground or fly through the sky at super fast speed with the detachable drone! Speed demons head to the race with Air Hogs Hyper Drift Drone. AIR HOGS HAVOC HELI RADIO CONTROLLED HELICOPTER GREY. Condition is New. Shipped with USPS Priority Mail. Defy limits. Defy expectations. There are two ways to fly: take off in stunt board mode or carve through the sky in paraglider mode! Switch to Paraglider mode and the tricks get even wilder: take on 720-degree cyclones, sidewinders and evaders! This Air Hogs Helix Race Drone 2.4 GHZ, Red RC Vehicle With Sunt Button for Parts is in used, non working for parts or repair only condition. One of the perpellars do not spin. There is chunks of styrofoam missing that surrounds the perpellars. Air Hogs. SWITCHBLADE HELICOPTER. Ground to Air Race. Drive and Fly. Condition: FOR PARTS OR REPAIR. Spins but doesn't fly. EAN: 778988225387. 5533675 B4275. Switchblade is for ages 8 and requires 4 aa batteries (batteries not included). Gyro-stabilization provides a smooth, easy-to-operate flight. ALSO NOTE THERE MAYBE SMALL FINGERPRINT MARKS AND SMUDGES WHEN WE HAVE INSPECTED THE ITEM.